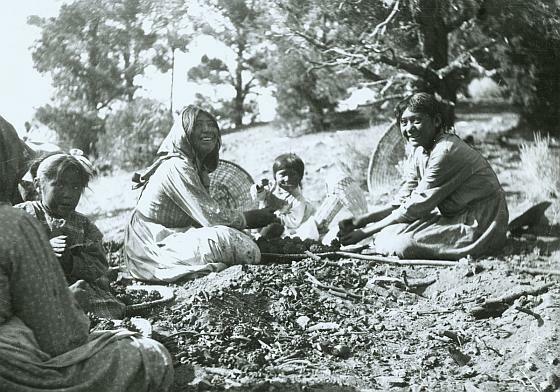 Artist rendering of Tabuce or Maggie "Taboose" Howard, Yosemite-Mono Lake Paiute in Yosemite Valley with a wono basket and winnowing tray. These baskets were often used to pick pine nuts and winnow them. The drawing was done by Yosemite-Mono Lake Paiute Roger Salas. The picture on the right is of a Pinon tree taken in Hetch Hetchy Valley in 1937. The tree is very large and hundreds of years old. 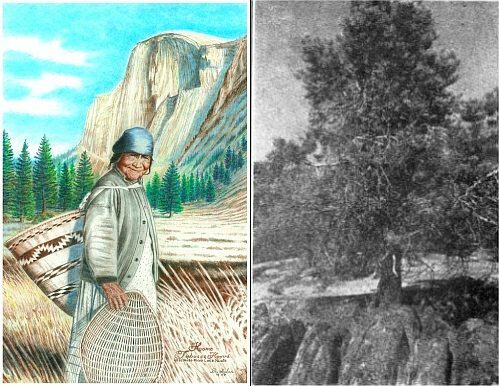 Early hikers, park officials and Park geologists find Pinon trees in the area of Hetch Hetchy Valley in northern Yosemite and it was documented in early reports. Part of the this story was published in the Yosemite Nature Notes in January 1937. The story was about how a Sierra Club party discovered a Single-leaf or Pinon Pine in Yosemite National Park's Hetch Hetchy Valley. Then as more people traveled into the location they discovered more Pinon trees. This tree is found mainly on the eastern side of the Sierra Nevada and the nut of the tree, or pinenut, is a food staple of the Paiute Native people. "In 1909, Mr. H. W. Gleason, with the Sierra Club party, discovered the first-known occurrence of the Single-leaf or Pinon Pine (Pinus monophylia, Torrey or Fremont) in Yosemite National Park. Jepson in his "Trees of California" issued December 15, 1909, says, "On the west slope of the Sierra Nevada it occurs in a few circumscribed localities, in Piute Canyon, near Pate Valley (Grand Canyon of the Tuolumne River), Kings River, along the west wall of the Kern Canyon, and southward into the lower Kern country." Harvey M. Hall recorded in "A Yosemite Flora," 1932, that the specimen found by Mr. Gleason was at about 5500 feet altitude in the Piute Creek Gorge. This single tree has been noted several times since by park officers. It is supposed to have been accidentally planted by Paiute Indians enroute from Mono Lake country to Pate Valley, a favorite summer camp. On September 14, 1936, while on a field trip with Mr. F. E. Matthes, Senior Geologist of the U.S. Geological Survey, from base camp in Tiltill Valley, I discovered a small Single-leaf Pine tree at 5800 feet altitude, 150 yards south of Tiltill Valley Trail at the point where the up-trail from Hetch Hetchy reaches top of the ridge and makes a slight dip. We were once aware of the presence of a number of trees of this species so made a survey, finding there were between 100 and 200, varying in altitude from 5800 to 6100 feet, spread over an area of some two acres." "Where these trees planted by the Indians? Mr. Matthes and I noted a ducked trail out across these natural shelves to "Pinon Point" (which they named after the trees) and on up the ridge. We followed these markers EASTERLY around a high dome, and were led into the upper end of Tiltill Valley. I consulted Mr. Gabriel Sovulewski for many years Supervisor of Road and Trail construction in Yosemite, and he said he had tentatively laid out this route following an old Indian trail, but had later abandoned it for the more direct, present Tiltill Valley Trail location.